Russell Brand wants people to show their protest by not voting. People have been not voting in steadily increasing numbers for decades and things have stayed much the same during that time. That form of protest has been labelled voter apathy with pundits claiming the falling turnout indicates that people simply don’t care about politics or the decisions that govern our lives. What’s worse is that the extension of that analysis suggests that people are actually happy with the way things are; the argument being that surely, if people were unhappy then they would go out and vote. Back in the sixties, when I was at school and the world was busy landing on the moon and listening to the Beatles, my dad used to spit angst at general elections as the returning officer, in black and white, would declare the number of spoilt ballots. (I can’t recall how I managed to stay up until the early hours to hear the results but it may have been part of my political education.) I learned from him that a spoilt ballot was when someone went to vote but instead of ticking a box they wrote something on the ballot paper. I got the impression that such writings would usually be something like, “You’re all a bunch of crooks”, or some such. I don’t think he ever spelt it out but it wasn’t difficult to figure out the sentiment and I’m sure there were swear words involved. He would be so angry about the fact that someone would go to vote but then abuse the ballot paper in this way, especially when so many generations had to fight for our right to vote. But we were missing something. If those people didn’t care about politics then why did they bother to go out to vote at all? They didn’t have cars in those days, people wore hats instead, so going to the polling station took considerable effort. But they didn’t have to go to the polling station so they could hardly be described as apathetic. If they wrote, “Why don’t you all feck off?”, on their ballot paper they must have really meant it. 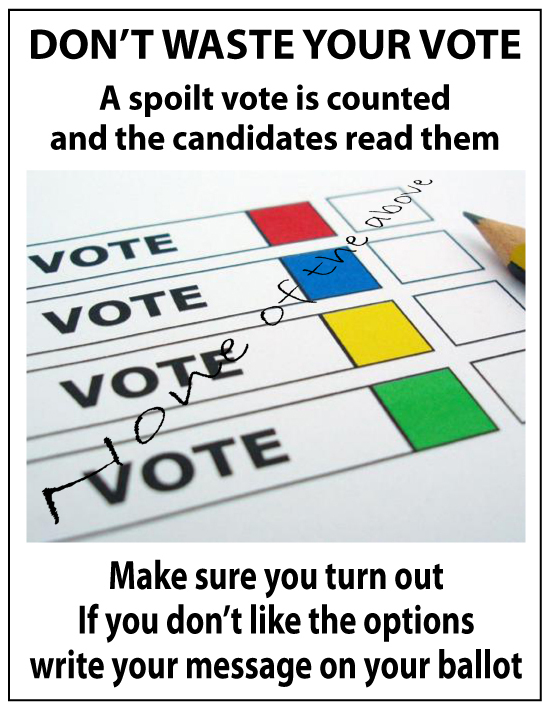 So it seems a spoilt ballot counts for quite a lot and it really doesn’t indicate apathy. Today my dad has been dead for over 20 years but I’ve learned something recently that I’d really like to have been able to check with him. Did he know that every spoilt ballot is shown to all of the candidates or their agents? You can imagine why this might be the case. The official term is doubtful ballot paper as the intention of the voter can’t be attributed to any specific candidate but people commonly describe them as spoilt ballots. In this situation the candidates would want to be assured that no votes intended to be for them were being passed off as doubtful. (Our democracy contains many such checks and balances that most of us have no idea of. Anyone who says that we have a poor democracy clearly isn’t comparing us to many parts of the world where such care is not taken.) So did my dad know that every paper that said, “Frack off the lot of you”, or perhaps, “None of the above”, was read by the candidates? We constantly hear that, more than ever, people are unhappy with the state of our politics, but what are our options? We can vote and be part of the system; alternatively we could stay at home and be labelled apathetic, and nothing will change. Something like 35 percent of people didn’t vote in the last three general elections and were described as apathetic. The numbers of spoilt ballots is difficult to know unless you know who to ask and I suspect you would have to add up each individual count. But just imagine if we mobilised that 35 percent to go out and write, “None of the above” on their ballots. You could hardly describe that 35 percent as apathetic even if what they’ve written isn’t quite so polite. (The biggest political parties can barely manage 35 percent of the vote so the protestors could be the biggest group.) The British are known to be polite but given the anonymity of a crowd, or dare I say the ballot box, then that politeness can give way to forthright passion. To be honest I’d rather you vote for the Greens but if not then vote for someone. Whatever your opinion, if you can’t find a party to support then go to your polling station and send a message to your MP. A few people have been asking for evidence of the fact that polititians read spoiled ballots. I’ve had contact with at least one prospective MP who has been to many counts and he tells stories of the sorts of things he has read on ballot papers. However, here are a couple of extracts from the Electoral Commission documents omn the subject. You should also provide appropriate opportunities for those who are entitled to observe and to object to doubtful ballot paper adjudication decisions. This should include ensuring that bundles of counted ballot papers are stored in full sight of counting agents in a way which allows them to monitor progress throughout the count. When undertaking the adjudication of ballot papers it is important to ensure that the process is carried out in full viewof all candidates and agents present at the count, as well as in the presence of any Commission representatives and accredited observers in attendance.